We are improving the ways an exhibitor can touch the targeted audience within the increasingly competitive trade show environment. A new patent-pending software platform developed by Harborside Interactive, LLC, harnesses the interactive computing power of the iPad within a synchronized array, allowing for numerous levels of face-to-face marketing between trade show exhibitors and attendees. Harborside debuted this new system, known as Sync3 Technology, at the 2012 Annual Meeting of the Healthcare Convention & Exhibitors Association in Orlando, Florida. Sync3 Technology allows the synchronization of multiple tablet computers, including iPads and Android- and Windows-powered units, into a large, scalable display, while allowing each individual tablet to retain its own independent functionality. Multiple viewers may watch a video that displays across the entire array of tablets, and at the same time, a single user may interact with one tablet and its unique features. 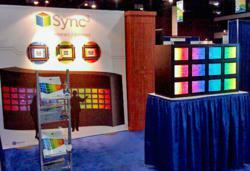 On Monday, June 25, 2012, the Sync3 Technology exhibit won the Best Booth Award at the HCEA Annual Meeting. "This technology allows exhibitors to reach their audience in two ways," said Anthony Cutrone, the President of Harborside Interactive. "Users can 'passively' watch a beautifully rendered video or interactive game displayed on the iPad array, or they can 'actively' use a single tablet for a deeper connection to the exhibitor’s products or message. With either method, we are improving the ways an exhibitor can touch the targeted audience within the increasingly competitive trade show environment." Sync3 Technology includes a number of customizable, interactive features for exhibitors, including the integration of existing content (such as product information or videos), data share and capture (using the tablet's built-in camera), shopping cart capabilities (for delivery of customer-selected exhibitor product information), and crowdsourcing options (such as quizzes, polling, and goal-oriented project development). There is also the option for interactive games played across the entire array of iPads, within an individual iPad, or pitting one tablet against another. "Our goal was to have each tablet offer the user a unique and private experience while capitalizing on the myriad opportunities that an array of tablets may provide," said Frank Buchner, the Chief Technology Officer of Harborside Interactive. "With this in mind, we developed Sync3 to be completely scalable, allowing for small displays on a tabletop or for large walls built with over 100 synchronized iPads." For more information about Sync3 Technology, please contact David Horowitz (631-935-7652; david(at)sync3tech(dot)com), or visit http://www.Sync3Tech.com. Harborside Interactive, a division of Harborside Press, LLC, is a developer of digital solutions for the pharmaceutical, biotech, and manufacturing industries, as well as medical media companies and tradeshow exhibitors. Harborside Interactive has experience in Web development, mobile application production, content management systems, relational database administration, and clinician- and patient-targeted communications, closed-loop marketing, online CE/CME, virtual meeting and convention solutions, mobile- and PC-based gaming, social network–based strategies, and analytics, as well as working with internal and external regulatory requirements. Harborside Press is a specialty medical publishing company based in Cold Spring Harbor, New York. Harborside Press is the current publisher of JNCCN–Journal of the National Comprehensive Cancer Network and the Journal of the Advanced Practitioner in Oncology, and also publishes The ASCO Post under a collaborative arrangement with the American Society of Clinical Oncology. For more information on Harborside Press or Harborside Interactive, please visit http://www.HarborsidePress.com.